So being part of a Professional Learning Community (PLC) not only makes me reflect on my own practice but also help me experiment and share ideas with others. Three years ago I decided to leave my home country and experiment with international teaching. My background was teaching post-16 students (16-19 year olds), lecturing in a very successful college in the UK. My first international post, I got to work with someone who was not only passionate, but had so many great ideas. He had more experience with the younger age groups, while I had more experience of the older age groups. We connected straight away, similiar ideas for what we wanted from a good Phys Ed curriculum, both creative, and he introduced me to Twitter for professional reasons. So I thank you @PEwithMike ! Three years down the road I have had an amazing journey, and it seems to get better and better each day. I have had the opportunity to spend time with some of the most influential people in the Phys Ed world at the moment. Meeting @mrrobbo at one of his amazing workshops, had Teppanyaki with this years PhyEd Summit keynote@andyvasily , drinks with@FizzicalEd , and even interrupted@MissHartl while on her lunch. The list grows each day being connected with more and more amazing people. While being part of the #physedme group set up and pushed forward by @osama13, the amount of good practice and sharing ideas never stops. We have a Google Hangout around twice a month and just discuss what is going on in are schools. Very similar to the #PEPLC , that I happened to be a part of last year with the amazing @PENathan , @KenForde and others. Last week I was luckily enough to be asked by @BodePE to be part of his roundtable as part of the #highschoolPE and though I managed to get a few points across I had technical issues, and didn’t get the opportunity to tell people about the great things that are happening. Being part of twitter is good as it allows for those interactions to take place, but @voxer and GHO allow for a lot more collaboration and can expand upon ideas. The #physedme group is very active on all three platforms, and I find that I speak to a lot of these educators on a daily basis. 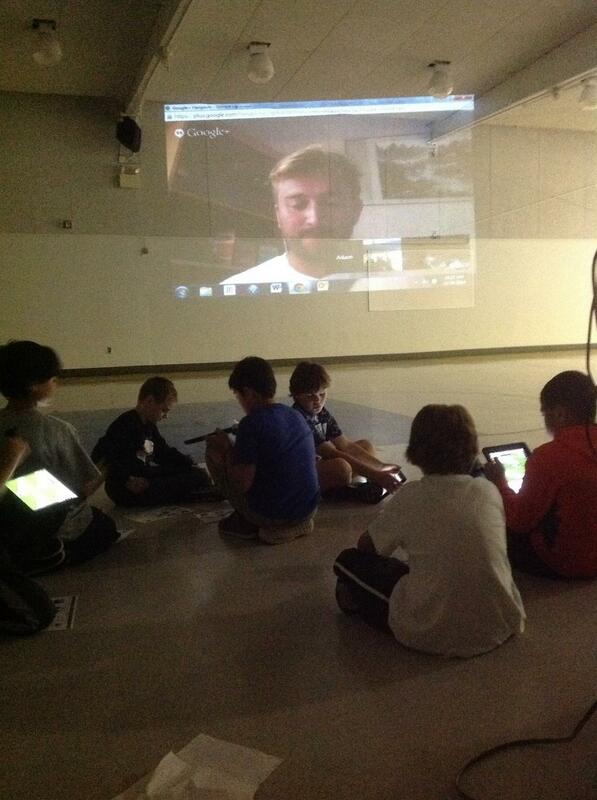 From over 6200 miles away I was put in touch with @NicholasEndlich & @SchleiderJustin , and we started collaborating. “How cool would it be if we did, x,y,z” and this seems to happen a lot on twitter/voxer, but as we are all very busy we never seem to get round to it. Well this time we did make it happen, collaboration at its best. First of all we came up with the #soyouthinkyoucanbalance challenge, (http://goo.gl/3CKruH) and we have a few more ideas in the pipeline. Then how cool would it be for me to teach a class. 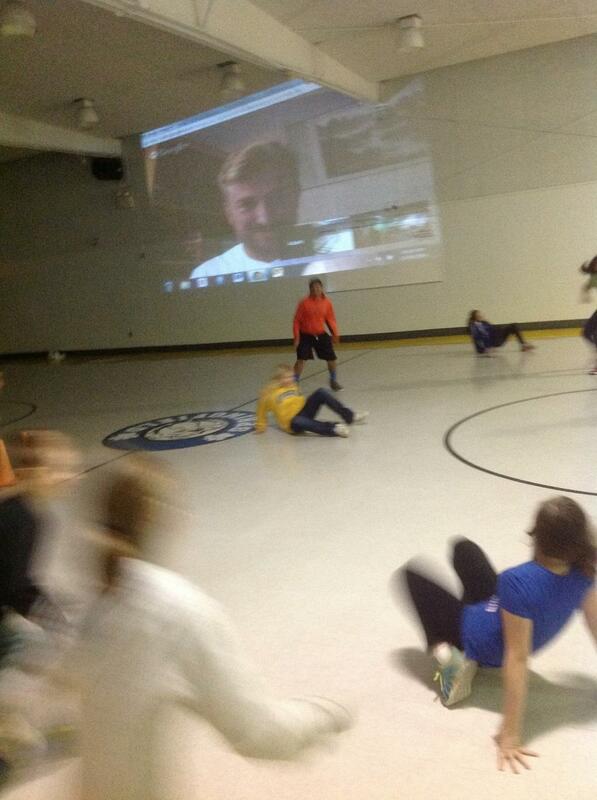 How can you teach a PE lesson with me being in one country, and your class being over 6000 miles away? Via GHO of course!!! Yesterday I was lucky enough to be invited by both @NicholasEndlich & @SchleiderJustin into their classrooms to deliver a session. What could I deliver that would be a little different to their normal lesson content in the US? I remember seeing a tweet “@Physed_Pomeroy teaches rugby instead of football, cricket instead of baseball. Gives his Ss a wordly curriculum. #MYPPE #PhysEdSummit” why not teach them rugby but with american footballs, I had done similar in China. Before the session I had asked @NicholasEndlich & @SchleiderJustin to take pictures of their gyms, then I could show the Ss each activity and how it would progress. Not being their in person, I had to think of a different way to present the information. After seeing a post from @mrrobbo using Coachnote I thought that would be the best way to show the students what I wanted them to do (http://goo.gl/RNtI8B). Now trying to make sure they all understood what I wanted them to do was a slight challenge, as @NicholasEndlich & @SchleiderJustin had muted themselves, so that it did not interfere with the noise and the Ss could just hear me. Yes great for me, but I could not really get student answers, so had to revert to thumbs up or down if they understood. Though they did use the padlet I set up for them to ask questions and I could give them feedback. This was a great opportunity for all, I would like to thank @NicholasEndlich & @SchleiderJustin and look forward to doing something similar again with these two amazing educators and others in the future. « Using Daqri – Glorified QR Reader?? Love the post and idea for the lesson, Adam! Coach Note was definitely the way to go! Great job as always!